The title to this thread is not very good, and for that I apologize. However, I am trying to find out some very specific and difficult information. I have already contacted the National BSA Office, the local council office, and NESA as well. All of them tell me that they do not have the information I am looking for. Having said that, I am turning to you guys for some help. I was curious as to who had the longest string of consecutive Eagle Scouts in their family? For example, you hear about father-sons who both earned their Eagle. Sometimes you hear about Grandfathers, Fathers, and Sons...which would be three consecutive Eagles. However, not only am I curious as to what the longest string of consecutive Eagles would be, but if it is four or five, who are they? How can we find them? I know...kind of random...but thanks. @Podunk21 , I took a try at the topic title. I found these families with three generations of Eagle. Thanks. I have tried some "Google" and have found a few links / news stories like this. Thanks for sharing these. I was hoping there was a better way of going about this, seeing that not all of them will end up in the news. Wow, great finds. Maybe I will start my own database of these people....since there is no other record. Unfortunately, no one else is tracking it and I know these are not the only ones....they are just the only ones that end up in the paper. I am sure there are many more cases than these floating around somewhere. I have a friend who is a third generation Eagle Scout, and he has kids of his own who will likely earn their Eagles within the next few years, so that's easily 4 generations. As for my family, we are slowly growing our own crop, lol. My father is a Life Scout, but all three of his sons earned their Eagles, and now I have a brother with four sons and another with two - that'll be nine Eagles within two generations (and if I can convince some nice girl to marry my someday, maybe I will have little Eagles of my own eventually too!). In theory, six generations would be possible, but extremely unlikely. Five would definitely be possible. I would imagine there are a number of 4th generations and plenty of 3rd gens. This just made me think of Fredrick Russell Burnham. Besides inspiring and mentoring BP, he was later involved in Scouting. 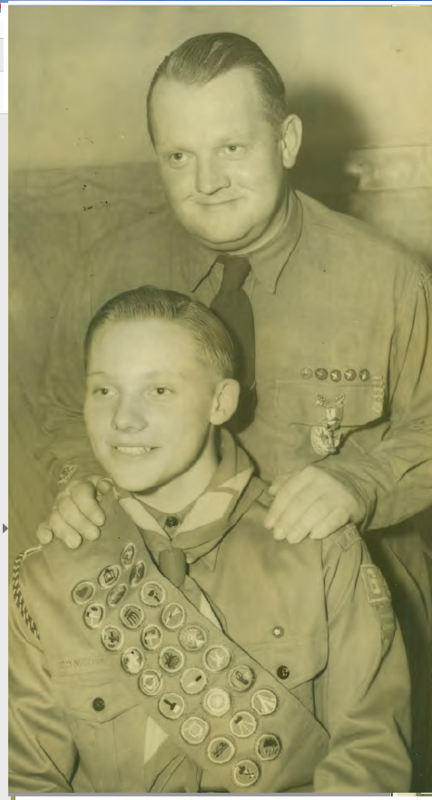 I believe his grandson was active as an adult volunteer in BSA and his great-grandson is an Eagle Scout. Not exactly a line of Eagles, but an interesting line to follow given FRB's place in the birth of Scouting. I'm a third generation Eagle Scout (1977) , behind my father and his father. My son is a Webelos Scout presently and may choose to do the same. My dad and grandfather were in the NESA database but not myself until I submitted documentation. Thanks for all the feedback. I have been tracking the people I know about, and am starting a database. I already have a bunch. I only know of one 5th Generation but he is unverified. Anyway, it's an interesting project. My family has 3 generations of Eagles - My Dad, myself and twin brother and one of my sons. I don't have any grandkids yet but my brother has a granddaughter so maybe she will the 4th generation. Interesting side note: My family was the inspiration for the article about the Simon and Kotter families of East Brunswick. When my youngest son, Matthew, earned eagle in 2017, I sent a photo and press release of My 86 year old father, who was a 2nd class Scout , myself (Eagle 1979) and two Eagle brothers, and my Life Scout eldest son and Eagle Scout middle son to the newspapers, and it was published. My high school classmate, Michael Simon, of the family in the East Brunswick article, read my writeup, and played "we can top that", which, of course, they did. We all had great memories of two fun Scouting families growing up in the same town, and competing against each other at camporees, since we were in two different troops. Good Times! Lt. General John M. Wright, Jr. and family - 4 generations. "He was an Eagle Scout. The son of an Eagle Scout. The brother of an Eagle Scout. The father of two Eagle Scouts. And the grandfather of one Eagle Scout." And he was much more to Scouting.. see his Celebration of Life.